Deboichet Dragon Line, production fins? 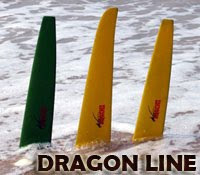 At the deboichet website and windsurfing44.com you can read about the new dragon line from deboichet. It is a move I didn't expect, what does this mean? Can productionfins really be improved much, produced in Thailand? Hope to read more about this, select fins seems to get more competition, both Select and Deboichet are based in France. On the pictures it is hard to see what quality we are talking about. Also just read (in SURF 3-2010) France and Germany buy more than 50% of Neilprydes productioncapacity... Is windsurfing really mostly an european sport???? 80% of the speedsurfingblog visitors came from europe in 2009. Now I start to understand why many windsurfing brands are based in France or Germany.